Butter a 2-quart ceramic baking dish with butter and set aside. Lightly toast bread on a baking sheet in oven, about 5 minutes. In a bowl, whisk together eggs, milk, dulce de leche, vanilla extract and salt. Arrange toasted bread in baking dish and pour over egg mixture. Let stand for 20 minutes. Place in oven to bake for 20 minutes or until bread is golden brown. Allow to cool for 10 minutes. Meanwhile, microwave remaining 1/4 cup dulce de leche until warm, drizzle over bread pudding and serve. Try this recipe using cajeta instead of dulce de leche. Try adding a layer of chocolate chips or sliced strawberries for a festive twist. 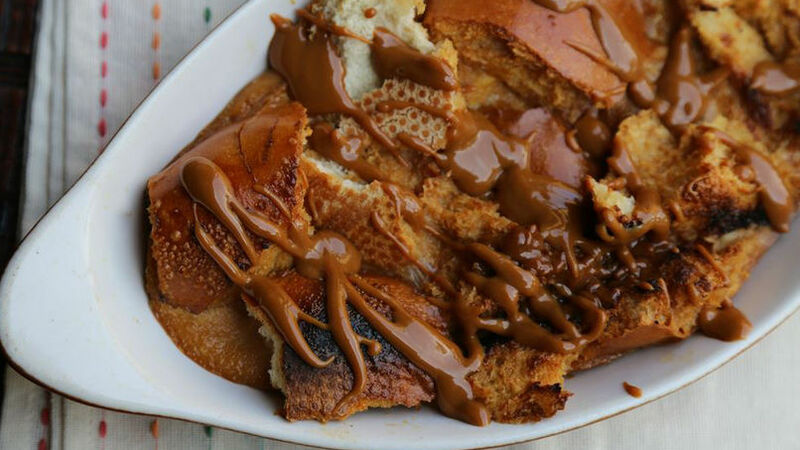 Surprise your family with a decadent bread pudding made with dulce de leche. Easy to make, this bread pudding will soon be a family favorite.